Lighting is an important element while doing up your home interiors. Every room needs adequate lighting. Lighting depends on various factors like the size, feel, style and use of the room. Each room is different from the other and that causes lighting to vary too. The perfect lighting does wonders to your room interiors enhancing them and taking them to a new level. 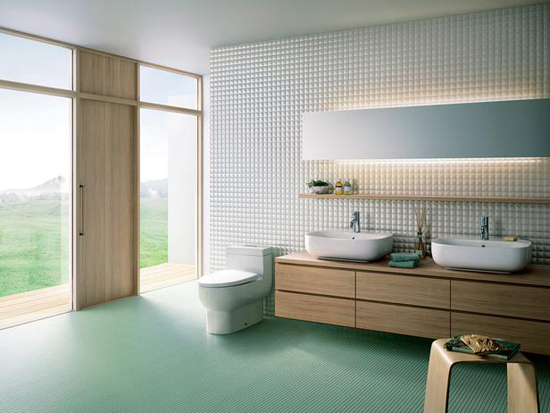 Today we will discuss in detail about bathroom lighting. We have got together some of the best bathroom light fixtures that add a luxurious feel to your bathroom. 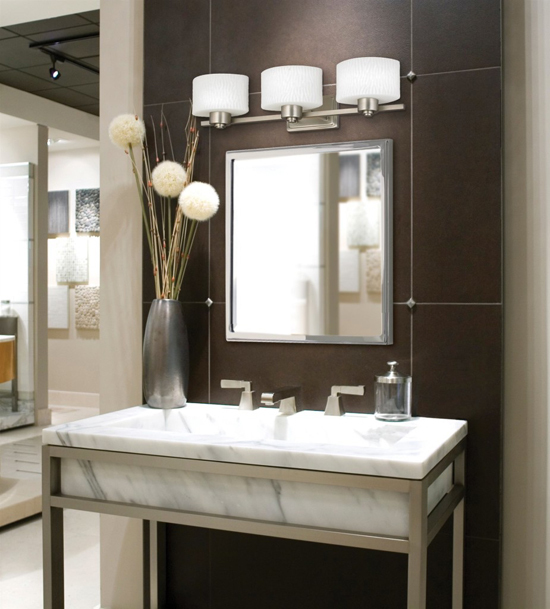 Add interest to your powder room area with these classy wall unit side light fixtures. Their unique design definitely adds an element of magnificence to your grooming area. The lights are designed with a chrome metal spiral pattern that is perfect for your modern bathroom setting. 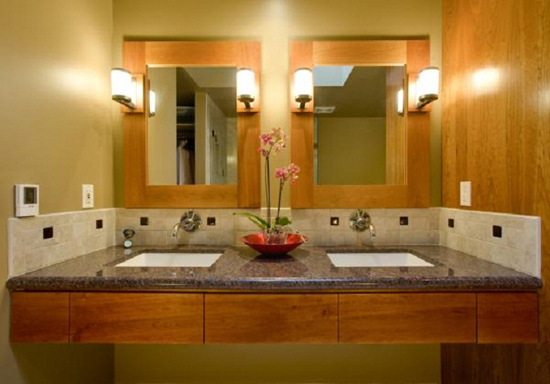 Adding a mixture of bathroom lighting fixtures is a fantastic idea to augment your bathroom. Spice up your bathroom with traditionally designed light fixtures. An elegant chandelier that lightens your entire bathroom and matching sconces fixtures are an ideal choice for your vanity area. Bathroom light settings must compliment your decor and provide one a relaxation ambiance. This classic and modern wall unit light fixtures create a soothing and calm effect in your bathroom. The cylindrical shape helps to light the vanity section in an even manner. Add class to your bathroom by providing it the appropriate lighting. 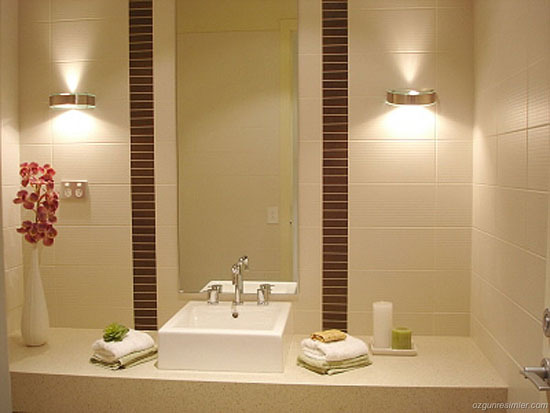 Led recessed lights are used in bath areas and powder rooms for illuminating purposes. Another striking idea displayed in this image is to highlighting your designer flooring by adding a light under your bathroom closet. It adds a charming and soothing effect to the interiors. 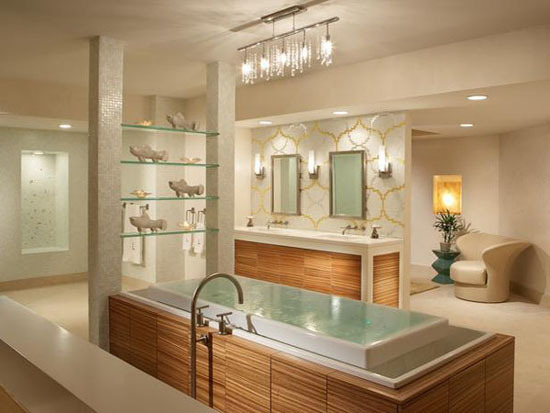 Design your bathroom with designer lighting fixtures to give it a luxurious feel. 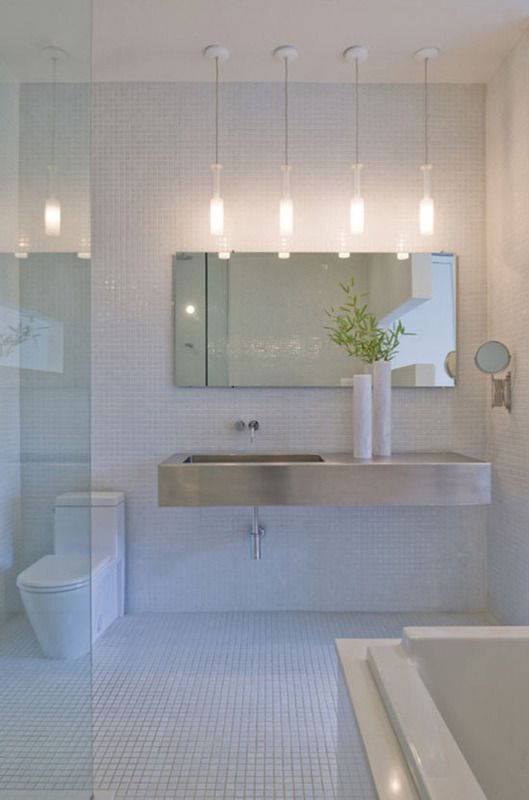 This bathroom is planned with contemporary interiors and enhanced with trendy sconces lights with frosted glass shades. They illuminate your bathroom with the perfect balance and style. Give your bathroom classic and lavish interiors with recessed light fixtures. 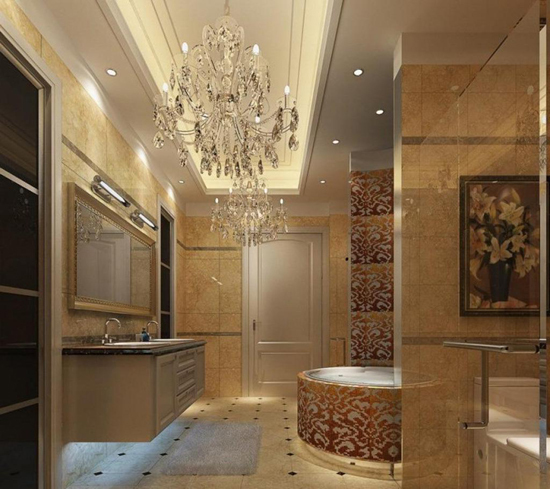 Recessed lighting fixtures highlight your bathroom décor giving it an opulent feel. 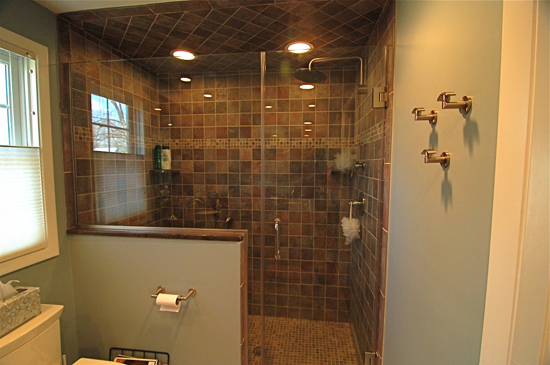 Here the brown square tiling and mosaic border design gives the shower area an elegant and striking appeal. This interior setting is further enhanced with the ornamental recessed lights. Another lighting idea for your bathroom is using wall hanging lights. 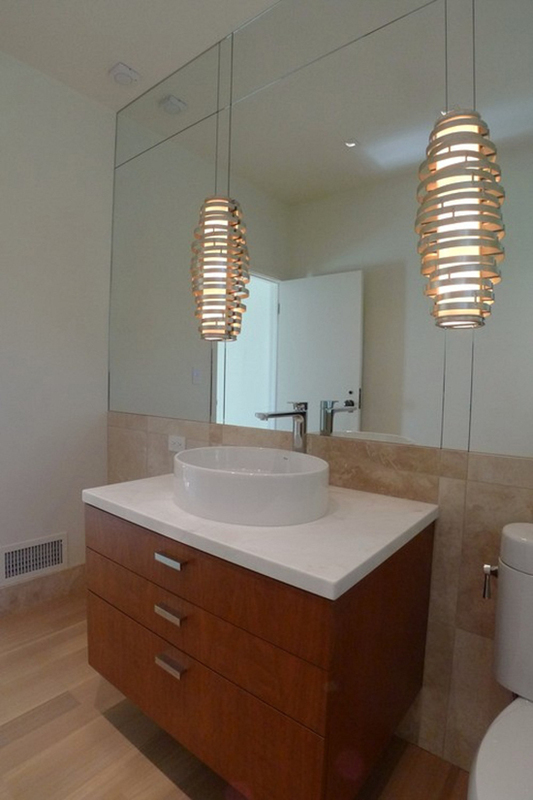 The hanging lights used in this bathroom setup are shaped in an elegant stem glass design. 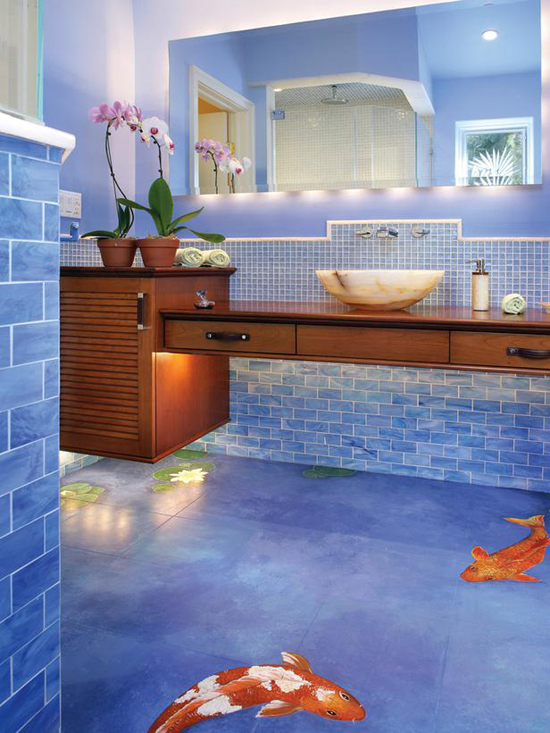 They light up your bathroom as well as accentuate the room with vigor. Add a glamorous touch to your contemporary designed bathroom. Installing a back-lit mirror will add vibrancy and opulence to your bathroom settings. It gives your bathroom a radiant ambiance that will be appreciated by all. One can add unique designer chandeliers to their bathroom to give it a unique feel. This classy yet trendy glass chandelier is one of its kinds and will give your bathroom a chic and sophisticated ambiance. 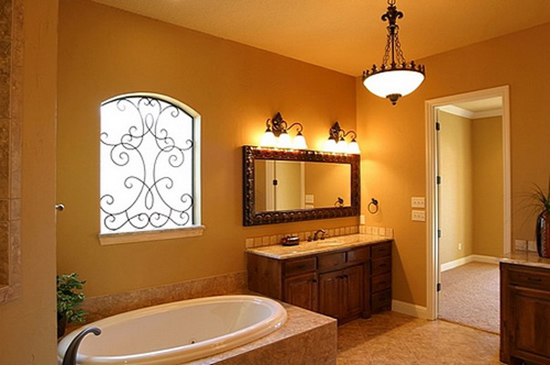 If you own a large bathroom, embellish it with decorative light fixtures. Augment it with glass candle chandeliers, recessed dim lights, stylish vanity lights and a under cabinet light. These are sure to delightfully add luminosity to your large bathroom. This image is an ideal example how to light up your modernly designed bathroom. The room is stylized with crystal hanging ceiling light fixture, vertical shaped sconces lights and multiple recessed lights. The interior designer has cleverly added buried led lights in the niches for an eye-catching touch. A gorgeous bathroom with the perfect bathroom light setting. Accentuate your rustic style powder room and bathroom with suitable light fixtures. You can add classic flat sconce light fixtures above the grooming area. This gives you the perfect ambiance to get ready with style and enjoy watching yourself in the mirror. 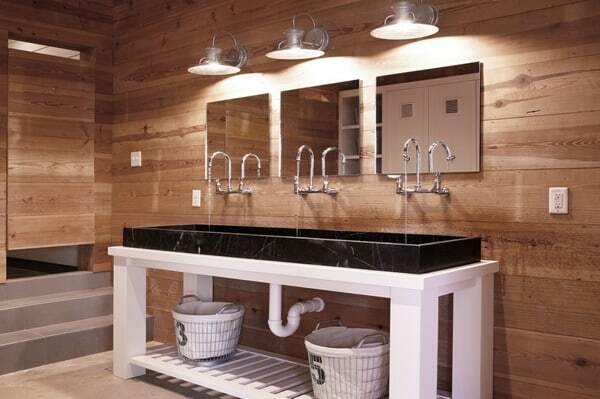 A lovely wooden bathroom with contrasting wooden furniture is everyone’s dream bathroom. 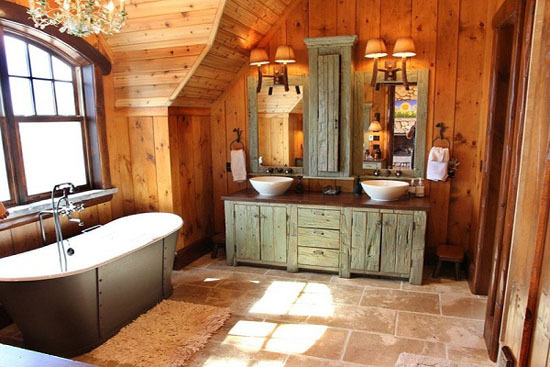 The bathroom is beautifully lit with natural light and is accentuated with wooden sconces with gorgeous shades. 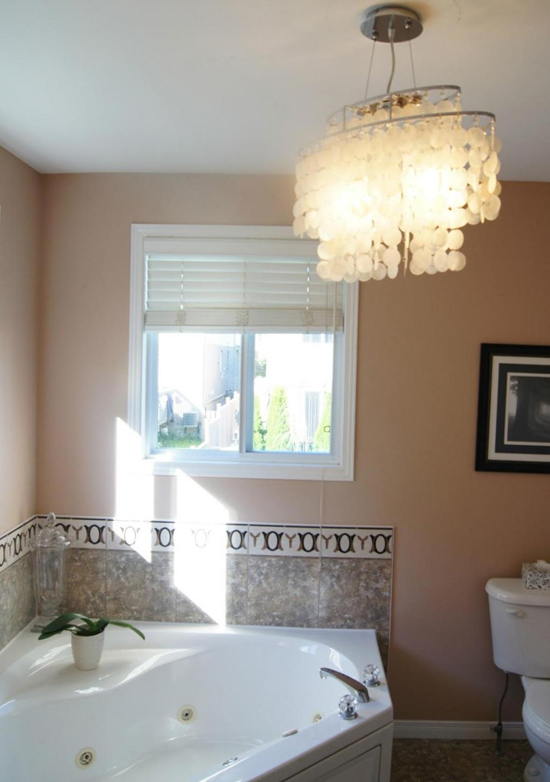 And the cherry on the cake is the glass chandelier placed above the tub area that adds radiance to the entire setting. A unique lighting fixture for your bathroom is a digital paper chandelier. This image displays a chic and trendy paper chandelier that gives your bathroom a modern and contemporary feel. Combine it with other wall mounted bathroom lighting fixtures to add radiance and oomph to the room settings. The mirror area in your bathroom is very important for shaving, make-up and grooming yourself. So, it is essential to light up this area with the ideal bathroom lights. Here the mirror area is highlighted with stylish wall lights that illuminate the powder area. An individual must pick the most appropriate and stunning bathroom light fixtures for their home. The ideal bathroom lights will help one create a flawless balance, comfortable and relaxing ambiance for their vanity and bathtub areas. The best option is to use a mix-match different type of light styles for a superior and radiant effect.